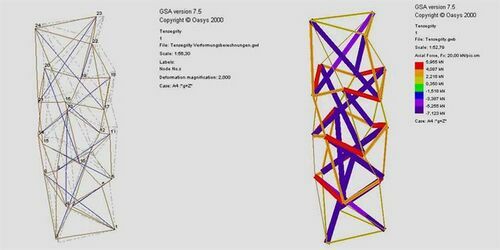 Read here about glass, a material used in tensegrity construction. Glass is an amorphous (non-crystalline) solid material that exhibits a transition from a hard and relatively brittle state into a molten or rubber-like state, called the glass transition. Glasses are typically brittle and can be optically transparent. The most familiar type of glass, used for centuries in windows and drinking vessels, is soda-lime glass, composed of about 75% silica (SiO2) plus sodium oxide (Na2O) from soda ash, lime (CaO), and several minor additives. Often, the term glass is used in a restricted sense to refer to this specific use. The atomic structure of a glass, like other amorphous solids, lacks any long-range translational periodicity. However, due to chemical bonding characteristics glasses do possess a high degree of short-range order with respect to local atomic polyhedra. Common glass's optical transparency, yet opaqueness to solid, liquid and gaseous objects, makes it an ideal substance for windows, computer displays, and eye-wear. As a result, glass manufacturers continue to innovate. Recent achievements include the glass stairways in Apple Stores, the Haus Pavilion in Rheinbach and the Yurakucho canopy in Tokyo. Corning Glass produces Gorilla Glass, a product popular on handheld device display screens. Gorilla Glass utilizes ion-exchange to manufacture optically-transparent glass that has a deep layer of high compressive stress. This is achieved by bathing newly sxtruded glass in a salt bath. In the bath large potassium ions replace smaller, surface sodium ions. The result is compressive prestress in the outer layers of the glass, formed in complement with increased tension in the glass's interior. The compression acts as a sort of "armor," making the glass exceptionally tough and durable. This glass has a Vickers hardness test rating of 622 to 701), allowing thin glass without fragility. Glass breaks when damage, such as a scratch or a chip, on the surface is subjected to bending or other stresses (tension). Scrapes and bumps are a fact of life for mobile devices. Because of the deeper layer of chemical strengthening possible in Gorilla Glass, though, flaws from field damage are more likely to be contained in the compressive layer on the surface of the glass, helping protect the tension layer underneath. This makes Gorilla Glass better able to resist damage from the abuses that come with everyday use. 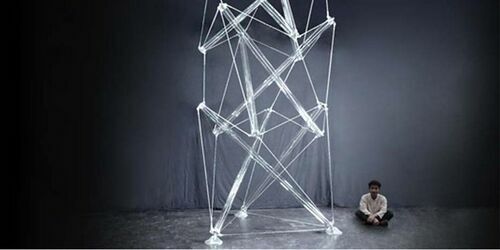 Froli proposed a beam composed of triangular glass faces joined in a tensile net. 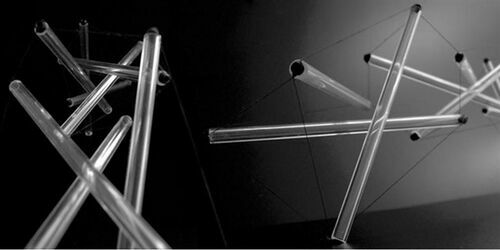 The separation of tension and compression in tensegrity inspired the design. However, the resulting beam is not a tensegrity in the classice sense. Froli's statement: High transparency and modularity, retarded first cracking, non brittle collapse and fail-safe design were the basic requirements that inspired and guided the development of a new kind of glass beams. 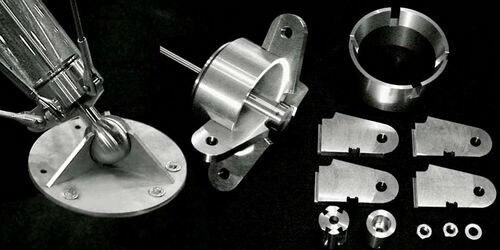 The two basic conceptual design goals were to avoid any cracking at service and to get a ductile behavior at failure. These objectives were reached by anticipating and directing cracks with the subdivision of the beam into many small triangular laminated panes and by assembling them together by means of prestressed steel cables. 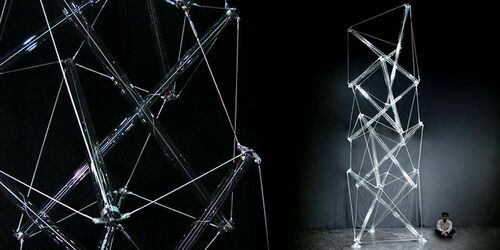 Glass is sometimes deployed as struts in tensegrity structures. 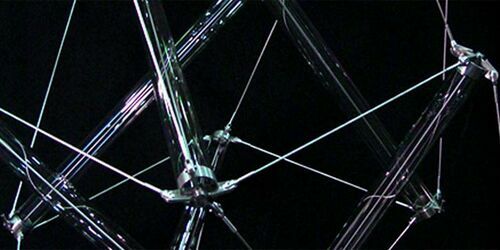 Schnubel engineered a tensegrity mast composed of glass struts. The architect was Roland Haehnel. The mast is 6.80 m high and consists of 12 glass tubes and 48 cables. All tubes are pre-stressed with interior steel bars to guarantee their compression during construction process. Every glass element is pin-ended with a stainless steel detail. The sculpture was first built at Glasstec, Dusseldorf in October 2002 and rebuilt at GlassCon in Munich in January 2003. Glass Strut Tensegrity Mast by Schnubel, 2 views. 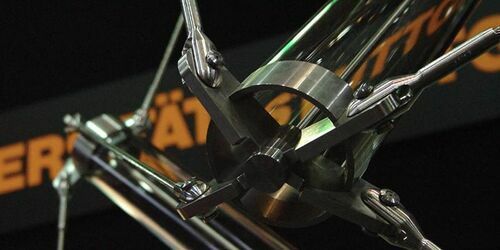 Closeup of connectors used in the Glass Strut Tensegrity Mast by Schnubel. Closeup of steel rings with internal steel rod. Base of the Glass Strut Tensegrity Mast by Schnubel. Glass Strut Tensegrity Mast by Schnubel, Detail. Oasys CAD rendering of Glass Strut Tensegrity Mast by Schnubel. Glass Strut Tensegrity Mast by Schnubel, 2 detail views. 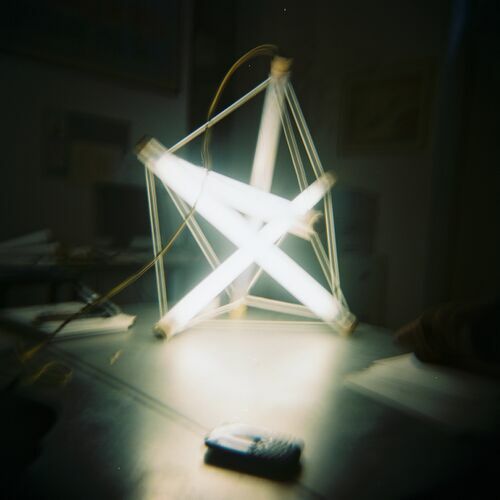 Fluorescent light bulb fixtures are used by many tensegrity artists, designers and researchers. Below are a few sample images; for more details, see Lighting Fixtures. 4 strut lamp by 9999 pure. 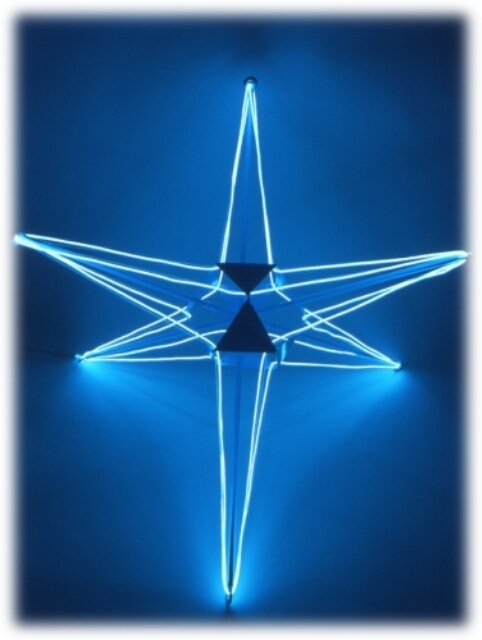 Nucleated strut electroluminescent tensegrity light by Senior, 2002. This page was last edited on 24 November 2018, at 13:46.